Last fall, as I mentioned here, I sat in on an Art History seminar titled “Problems in Early Christian Art.” It was a really valuable experience for several reasons, and one of the big takeaways for me was the rather frank admission on the part of the professor, as well as several of our readings, that the origins of Christian uses of figurative art are murky at best. As much as art historians might like there to be a clear narrative of “pristine original Christianity seeing any and all images as idolatry” vs. “big corrupted institutional church with pagan ceremony adapted for imperial use,” that narrative just isn’t supported by the evidence, and the narrative that can be constructed from the evidence is still quite foggy. There is definitely a strain of what can be read as image-cautious (at least) rhetoric in some early writers, but the fact is that the images were nonetheless there in one form or another from earliest days, and they didn’t go away. What struck me was that veneration of images always seemed popular, in the sense of it being something that the people did, and it didn’t appear to matter too much who was telling them not to do it — it was instinctive to make an image of the object of one’s devotion, and this had even more meaning in an era when not everybody had digital cameras on their cell phones. For me, it raised the question — is it possible that the theological place of images was simply something God chose to reveal in a “bottom-up” fashion rather than “top-down”? The question of divine intent is obviously not the kind of matter one can address using secular historical methodology, but in any event it was fascinating to hear a secular academic acknowledge that the history doesn’t fit into as neat of a little box as they would like. 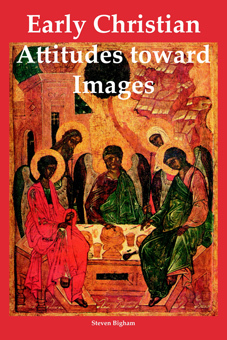 Early Christian Attitudes toward Images by Fr. Steven Bigham, published in 2004 by the Orthodox Research Institute, examines this absence of a neat narrative from an explicitly confessional point of view. It is a translation of a work he originally published in French in 1992; Fr. Bigham is a Carpatho-Russian priest who serves the Francophone Orthodox community in Montreal, and who teaches Orthodox theology at Université de Sherbrooke. In a nutshell, his argument is that the historical and scriptural witness in no way supports the idea of the Second Commandment being understood by the Jews as an absolute prohibition on figurative art, with or without a liturgical use, and neither is there a clear, unambiguous witness either from the New Testament or from patristic writings supporting such a blanket hostility towards images. Examining the historical evidence up to 313 A. D. (in other words, using the Edict of Milan as the dividing line) he argues that while there is a clear and universal condemnation of idolatrous images, it does not follow that all images are presented as idolatrous. In fact, he points out, St. John of Damascus understood a writer like Eusebius of Caesarea to be supportive of Christian images, as opposed to the contemporary perception of Eusebius as proto-iconoclast. In many ways, a book like this is useful as a tool for the faithful more than as a scholarly work. It is an excellent introduction to the historiography of this problem, a good overview of the major scholarly players and the literature (with whom and which Fr. Bigham is clearly very familiar), and it’s extremely useful as a tour through the source texts and the archaeological evidence. His argument, as presented, is an absolutely fair set of points; he makes plain that the rhetoric of the textual sources must be both properly understood in terms of their context as well as reconciled with archaeological evidence, and that when you do that, there is no way to arrive at the conclusion that pre-Constantinian Christians were uniformly and universally against the use of images for Christian purposes. For the Orthodox Christian wanting to understand more about what the scholarly discourse is regarding the history of Christian art, this book is a terrific place to start, and should also be an excellent catechetical tool. It seems likely that this is just an author’s mistake not caught by the translator or the editor; that the English translation on p. 99 was probably just mismatched to the wrong Latin text — or there was some similar error — and nobody along the way in the editorial process knew enough Latin to be able to catch the problem. Even if that was what happened, it is unclear which passage we are supposed to understand as being important to Fr. Bigham’s point. The net result is that it just looks like it was translated wrong one way or the other, and it doesn’t leave the reader who does have knowledge of Greek and/or Latin with confidence in Fr. Bigham’s ability to properly analyze these texts. Another, more minor, quibble is that, while extensively footnoted, the book lacks a comprehensive bibliography. The footnotes are perhaps the single most valuable asset this book has, but a catalogue of primary and secondary sources would make the book more efficiently accessible from a scholarly point of view. In summary, this is a book well worth reading by the armchair Orthodox Christian art historian — perhaps in conjunction with a sourcebook like Cyril Mango’s The Art of the Byzantine Empire 312-1453 — as a clear discussion of the issues, the sources, and the scholarship. It is also a worthwhile read for the theology student who is interested in a frankly Orthodox exploration of the topic. Fr. Bigham demonstrates considerable facility in engaging the literature on the matter, and his citations alone are extremely valuable as a reading list on the topic for both scholar and casual reader (although do be aware that, while the English translation is recent, the original French text dates back eighteen years, so scholarship cited tends to not be later than the 1980s). In terms of its academic use, however, it seems to me that it might best function as a roadmap for somebody who is more comfortable accessing the Greek and Latin sources in the original languages, and be able to more convincingly analyze those texts with authority. It is certainly the kind of contribution that Orthodox scholars should be trying to make to the bigger conversation, and it would be a welcome thing if it could be made in a way that makes a bigger audience more inclined to take it seriously.